After I interviewed Pol Pot in July and October 1997, my excellent magazine, the Far Eastern Economic Review–the sister publication of the Wall Street Journal and both owned by Dow Jones–nominated me and the story for a Pulitzer Prize. From my files: News articles I am digitally archiving here on this blog site. This story was written in 1990 after a many weeks walk deep through the jungle with Cambodian guerrillas. It was the first independent confirmation of guerrilla claims of advances made during the then 11-year old war. LAND MINE MOUNTAIN, Cambodia (AP)— “Don’t step off the path. There are mines everywhere,” the guerrilla warned over the din of rockets and artillery shells crashing ahead of us. The road ended abruptly at what the guerrillas called “Phnom Din”–Land Mine Mountain. 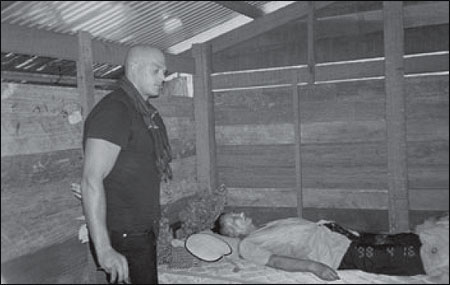 It marked my departure from Thailand and the start of a trek deep inside this ravaged nation. My aim was to confirm for the first time claims of unprecedented guerrilla victories in the 11-year-old war against the Vietnamese installed government. I accompanied 150 guerrillas loyal to Prince Norodom Sihanouk through three Northern provinces–over mountains and minefields, across enemy lines and secret jungle paths to newly seized towns and front-lines. “We all remember the Prince Sihanouk times. That was when there was no war and enough food,” said Reng Phum, 77, crying ina village near Stoung. Sihanouk ruled for three decades until he was ousted in a U.S. backed military coup in 1970. Cambodia was engulfed in civil war from 1970-75. From 1975-798, hubdreds of thousands of people died in starvation, disease and executions under the fanatical Khmer Rouge. The current war has gone on since the Vietnamese invaded in late 1978. Government artillery shook the earth every day protesting the guerrilla advances throughout the country’s north. Tens of thousands of villagers were seen in rice fields, markets, and schools in areas under guerrilla control. Totaling more than 700 towns and villages, it was the first major region controlled by non-communist forces in Indochina since the U.S. troops fled fifteen years ago. Everywhere I went, hundreds of villagers gathered for their first ever sight of a foreigner. Some had walked for days to do so. “Are they all fat and bald?” asked one elderly woman who stared at me for hours. Heavy fighting erupted as more than 1,000 soldiers were ordered from three provinces to get me. Soldiers seized villages hours after I visited. “They were looking for the American. More than 300 of them,” A farmer told us in Kvav village. “Which way did the American go? How long ago was he here?” They asked. Guerrillas said 45 government soldiers and to guerrillas died in these clashed. One terrifying night, we fled through the jungle from 500 soldiers stalking us after clashing with our advance team. The government army radio announced a reward for my capture worth $1000 U.S. dollars. The guerrillas moved me every day, fearing that government snipers disguised as villagers were seeking the reward, which was more than ten years income for the average Cambodian. They disguised me in traditional scarves and military uniform. “I think you are worth more than $1,000 dollars,” guerrilla commander Col. Khan Savouen said to console me. As we began the ten day walk to the Thai border, we talked by radio with guerrillas fighting soldiers on our pursuit. We slept in hammocks slung between trees and ate rice supplemented by lizards, snakes, deer, monkeys, wild boar, spiders, turtles all kinds of flying insects and other jungle creatures whose identity I could not even guess. Except for the crunchy, hairy insects, they were surprisingly tasty. “We really need to do something about this insect problem after we get peace, “one guerrilla said from under his mosquito net. Thousands of Khmer Rouge and Sihanouk guerrilla shared the jungles, but many passed each other without exchanging a word or a smile. 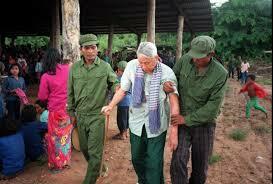 More than a dozen Khmer Rouge guerrillas defected to the Sihanouk side during the trip. They came in groups of two or three at night, whispering requests to switch sides. The Sihanouk guerrillas gave them new clothing to replace the green Chinese-style Khmer Rouge uniforms, to avoid protests from Khmer Rouge unites. Khmer Rouge guerrillas were shocked to see a Westerner in their jungles. Many young fighters spoke of entire lives in the jungles, without family or enough food or medicine. At the base of a mountain near the Thai border, we found an unconscious Khmer Rouge fighter abandoned by his unit four days before. Ants were eating him. A Sihanouk guerrilla carried him all day to the top of the mountain, and medics treated his malaria. ” I can’t go back to my village because the government is taking all the men and forcing us to be soldiers. I guess I will stay with those who saved my life and go home after peace,” he said, his voice quivering. We left Cambodia as we had entered it–through minefields. We waited for hours while mine specialists probed the area. The next ten kilometers (six miles) were horrifying. We saw dozens of mines, the thin green trip wires blending with the thick foliage. Around us were trees with pieces of clothing hanging off their branches–they belonged to people blown up by mines. For hours, no one spoke, their eyes locked on the ground. Covering the Cambodia debacle in the 1980’s and 1990’s was an assignment fraught with danger and intrigue. The Khmer Rouge had executed more than 4 dozen foreigners–the vast majority journalists. Their primary opposition, the Vietnamese backed and installed government of Hun Sen, has summarily targeted and murdered dozens more, in addition to burning their offices after they were ransacked by government mobs, jailing dozens more, and scores received regular death threats. Scores more fled the country. This is in addition to the pervasive organized crime figures, who held powerful sway over the entire government leadership. 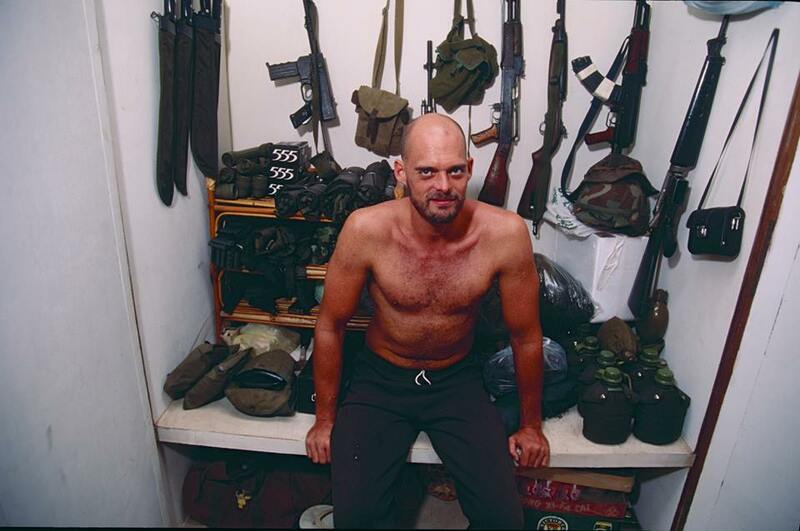 This photograph, by freelance shooter Ira Chaplain, shows me in front of my closet, which was equipped for pretty much any contingency, at my office and residence at the Phnom Penh Post, a fearless advocate, purveyor and defender of a free press which I remain proud to have been its senior correspondent. No better paper existed, in my mind, in the world in the 1990’s. One can never be too vigilant in defending the right of a free press to carry out their duties without fear or favour. Superior firepower often is a useful tool toward that end. UPDATE: Kickstarter campaign for publication of “Sympathy for the Devil”. Please excuse, in advance, the insufferable self-promotion seeking funding. Believe me, it mortifies me more than it will annoy you. That campaign will be officially launched soon. It was delayed after I sought and was denied permission to use the soundtrack of the Rolling Stones song of the same title–Sympathy for the Devil–as a soundtrack for the campaign. All fair enough, save it requires the remixing and editing of the video. That, and a few other minor, routine bureaucratic glitches, has meant the launching of the project may take as much as two more weeks to commence, but will be launched this January. In the meantime, I am proceeding ahead with the production process. All support, no matter how small or large, is welcomed with gratitude. For those inclined or willing to support the project prior to the official launch, it is both needed and appreciated. Please go to my blog site, natethayer.wordpress.com. In the upper right hand corner is a Paypal button that will easily walk you through the simple steps to donate. Along with the approximately 400 page hardcover book and an E book, this project will make available for the historical record hundreds of hours of related, un-redacted archive videos, interviews, and transcripts I have compiled over decades of chronicling Pol Pot and his Khmer Rouge and contemporary Cambodian Politics. It will include hours of raw video and audio interviews of Pol Pot and the entire senior Khmer Rouge leadership who remained alive after they did what they did. The project needs to secure the expertise of professionals, who, rightfully, need to be paid. They include manuscript editors, graphic artists, and various people with related technical skills for ensuring excellence in quality and presentation of the final product.